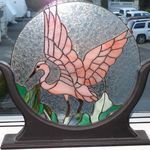 Stained Glass created by a seasoned artist over 40 years experience. Let us create a glass master piece of your or our design. All the colours of the rainbow, also multiple bevel glass designs various sizes and shapes.